This set of Linear Integrated Circuit Questions and Answers for Entrance exams focuses on “Basic Principles of Sine Wave Oscillator – 4”. Explanation: A biphasic oscillator is a sine wave oscillator. Therefore, the output signals will be two identical sine waves that are 180o out of phase with each other. 2. If the output of the sinewave oscillator is Vsinωot, then determine the output of the inverter in the Biphasic oscillator. Explanation: Since the output of Biphasic oscillator are 180o out of phase with each other. The sine wave passing through the inverting amplifier (with gain of one) outputs the signal with 180o phase shift. Answer: Oscillator circuits generate only one type of waveform like square, triangular or sine wave separately, whereas a function generator can produce all three types of waves simultaneously. 4. Which of the following have distorted sinewave? Explanation: The sine shaper in function generator produces a sine wave by rounding off the tips of the triangular wave. The distortion of the sine wave thus produced is ver high compared to the sine waves generated by other oscillator. Explanation: The generators and the oscillators are equivalent terms, they can be interchangeable. Therefore, the circuits producing sine waves are called oscillator, while those generating a square wave or triangular wave are generators. Explanation: IC function generator allows FM, AM and FSK of signals in addition to producing different waveform with variable duty cycle pulse. Explanation: The constant current is determined by the external resistors connected to current switches or the external capacitor connected to current controlled oscillator. 8. What will be the output, if a 180Ω resistor which was connected between 13th and 14th pin terminal is removed. Explanation: When pin 13 and 14 are open, the gain of the sine shaper become linear and the output from the sine shaper will be a triangular wave. 9. Find the difference of potential that can be applied to XR-2206 function generator. Explanation: If the power is applied to both V+ and V– inputs. Then, the difference of potential (i.e. V+ – V–) should be at least +10v but less than 26v. 10. The value of current and frequency of the output waveform are 5A and 13.33kHz. Find the capacitance value in function generator? => C=(0.32×I)/f = (0.32×5A)/13.33kHz = 120µF. 11. 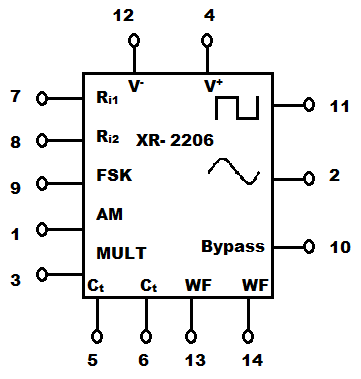 How many set of pins are required to control the frequency in XR-2206 function generator? 3) Voltage at Frequency Shift Keying connected to current switches. 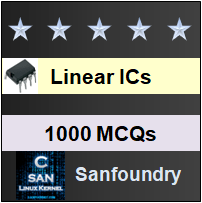 To practice all areas of Linear Integrated Circuit for Entrance exams, here is complete set of 1000+ Multiple Choice Questions and Answers.